Explanation: You're the first spacecraft ever to descend to Titan -- what do you see? Immediately after the Huygen's probe pierced the cloud deck of Saturn's moon Titan last January, it took a unique series of pictures of one of the Solar System's most mysterious moon's. Those pictures have recently been digitally stitched together to create spectacular panoramas and a dramatic descent movie. 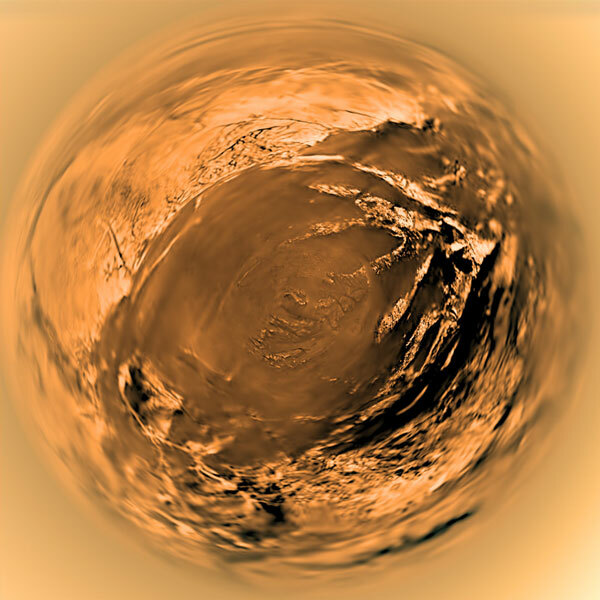 Pictured above is a panoramic fisheye view Huygen's obtained from about five kilometers above Titan's surface. The digital projection makes the local surface, mostly flat, appear as a ball, but allows one to see in all directions. Huygen's eventual landing site was in the large dark area below, just right of the center. This relatively featureless, dark, sandy basin appears to be surrounded by light colored hills to the right and a landscape fractured by streambeds and canyons above. Recent evidence indicates that Titan's lakebeds and streambeds are usually dry but sometimes filled with a flashflood of liquid methane from rare torrents of methane rain.